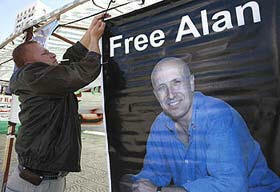 UNITED NATIONS, May 3 -- BBC journalist Alan Johnston has been held captive in Gaza for 52 days. 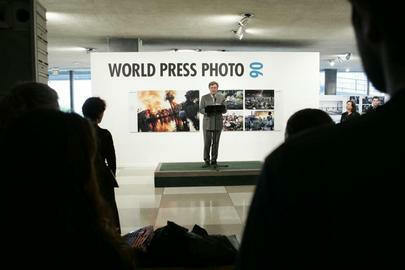 On World Press Freedom Day at UN Headquarters, these fact was heard repeatedly: in a rally in front of the UN, in a lunch sponsored by UNESCO and, delivered by Alan Johnston's boss Jon Williams, to a half-dozen reporters on Thursday afternoon. Mr. Williams was asked if the BBC has received random demands, a question to which he declined to comment. Well placed diplomatic sources confirm that such demands have been made. BBC's position, it is said, is that it would not object to the family paying ransom, but it will not do so itself, for fear of precedent. A UN source asked Inner City Press, was Alan Johnson there reporting for his family? Or was it for the BBC? Inner City Press asked Williams if any other BBC journalists have been taken hostage. Williams mentioned one case: "in Pakistan last year, one of our local stringers was abducted for a few days, in the tribal areas." He said that in the 75 years of the World Service, BBC has "never previously had a British correspondent kidnapped." Now, he said, "there is no other Gaza news except for Alan Johnston. It is a test for the unity government" and the Palestinian Authority. Some in the press corps grew uncomfortable with distinctions Mr. Williams made, between British and international journalist on the way hand, and local reporters, or stringers, or media workers on the other. Inner City Press asked if any other journalists are currently held hostage in Gaza. "No international journalists, right now," Williams replied. How about Palestinians? He said he wasn't sure. It was pointed out to Williams, with all due respect for Alan Johnston, that reporters are being killed every week in Iraq. Eleven reporters are dead from Al Arabia alone, since the beginning of the war in Iraq. Many others have been taking for ransom. Mr. Williams said, "I invite the bosses of other journalists who are abducted or kidnapped or killed to make the same hue and cry that I have, about Alan Johnston." But smaller and more local media outlets do not have the same bullhorn. BBC has the drum, and knows how to beat it. But some do not even have a drum. The answer is certainly not for BBC to do less to seek the release of Alan Johnston. BBC should use its drum. But what of the drumless? Can the drum be shared? It was surprising on Thursday that Jon Williams was not prepared to address the not-uncommon concern of the disparity in response to the kidnapping of one British journalists to the killings of dozens of Arab reporters, and untold additional "local media workers." A UN correspondent who requested anonymity to not offend the BBC analogized what the correspondent called the "over-kill" about Alan Johnston to the response to the seizure of the British sailors in Iran. Another went further back in history, and even more politically incorrect, to note the difference in media-time and peacekeeping dollars spent in the (European) former Yugoslavia to the (African) situations in Rwanda and now, for example, Somalia. Inner City Press asked if the BBC has any reporters in South and Central Somalia, particularly in Mogadishu. No, he said. The BBC Somali service used to "send people in and out," then withdrew. Are there local reporters there now? 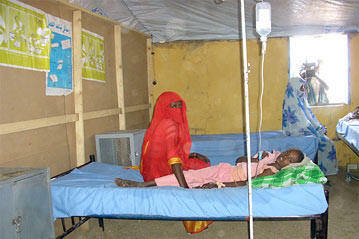 Williams said, "In all honestly, I don't know whether the BBC has local people reporting for the Somali service... I don't know." It might be important to find out. And while awaiting the hopefully-positive resolution of the Alan Johnston case, it might also be important for the news and media industry, BBC included, to reflect on these distinctions, between "international journalists" and, by implication less valuable, "local media workers." Reporters of global news are too well positioned, seeing the number of deaths and kidnappings in Iraq and Somalia and elsewhere, to not better address these disparities. One UN source interviewed by Inner City Press analogized the situation to "that American girl who went missing in Aruba." Why did CNN devote some much time to that, and not to the many more women killed in, for example, Juarez in Mexico? Another cynic opined that Mr. Williams' presentation, at least on Thursday afternoon, seemed more calculated to absolve BBC than anything else. Williams said that risk can never be eliminated, only "managed." He said that all BBC foreign correspondents get safety training, including on what a bullet-proof vest can stop, and what it can't. While Mr. Williams, even when asked if the training is "military," declined to provide more details, Reuters has a one-week long program called the "hostile environment" training course. It is offered by a private security firm comprised, Inner City Press is told, mostly of "former British special forces types." No one at Reuters including freelance photographers can go on a posting in a war zone or any place deemed to be a hostile working environment (like Darfur) without doing the training, whose cost is estimated at $10,000 each. Speaking of the importance of (some) press, Mr. Williams said that in a time when news is "two to a penny... there is a premium on serious journalism. Where there is so much noise, you need someone to make sense of it all." And these sense-providers are worth more than the "two to a penny" noise makers. (Conclusory) news analysis: Neither World Press Freedom Day, nor the just campaign to get Alan Johnston freed, have any place for elitism. It's not that BBC should not beat the drum -- it's that the drum should be shared. UNITED NATIONS, May 3, updated 5:45 p.m. -- While the U.S. Mission to the UN holds a forum celebrating the "citizen journalists," the UN has no policy for granting bloggers and other online media access to it meetings and briefings. Then again, the U.S. Mission on World Press Freedom Day itself held a by-invitation-only briefing by new Ambassador Zalmay Khalilzad and did not invite or even alert any bloggers. Rather, Inner City Press received from the U.S. Mission an invitation to the "Citizen Journalist: The Internet as a Tool for Freedom of Speech" panel, along with an invitation to "blog live" from the event. Fine. We're here. But to respect bloggers and freedom of speech is not to create a second tier, where as on the invitation other countries' press crack-downs can be panned. It is to treat fact-collecting bloggers as reporters, and grant them access. Wednesday at the UN, the Committee to Protect Journalists listed 10 press freedom backsliders, including a number of countries currently supported by the U.S.. 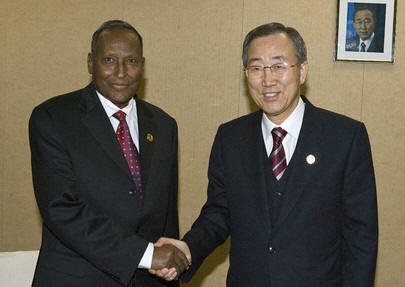 In the top three backsliders is Ethiopia, to which the U.S. provided military support in its drive on Mogadishu. Then, the U.S. allowed Ethiopia to import tank parts from North Korea. Ah, freedom of speech. Mr. Ban and Condi Rice: press access, anyone? But on to the panel. The introduction was by a Deputy Assistant Secretary of State, Jeffrey Krilla, who thanked the UN for "accommodating this event." Some wondered why, on the other hand, the U.S. had made Amb. Khalilzad available at its Mission, and not in the UN's press briefing room. Bridget Johnson a/k/a GOP Vixen then cited the CPJ finding that one-third of imprisoned reporters are online journalists. She turned it back to Krilla, who as it turns out beyond Democracy, Human Rights and Labor also has corporate social responsibility in his portfolio at the State Department. Has he raised press freedom to Yahoo, which turned over to China information about cyber-dissidents, subsequently arrested? Was Ethiopia's press freedom record considered in connection with the U.S. support, in connection with the crack-down on Somalia and otherwise? We'll see, if and when a Q&A session is allowed. Reporters without Borders spoke of new Predators of Press Freedom report, naming Mexico, Cuba and hostage-takers in Iraq. RwB cites 65 imprisoned cyber-dissidents, 50 of them in China. (Another panelist, with PointPoint presentation, were Frank Xie, a practitioner of Falun Gong and Watson Meng of Boxun News, who also detailed Yahoo's craven crack-down on dissidents in China.) RwB's Tala Dowlatshahi mentioned the case in San Francisco of the video blogger imprisoned for months for not given prosecutors the footage he had shot. Could that have been the Bush administration's Department of Justice? Even doing research on-the-fly, blogging from the event itself, it would seem so: the blogger Josh Wolf spent 226 days in Federal lock-up. Perhaps Mr. Krilla -- or even Amb. Khalilzad or Secretary of State Condoleeza Rice -- will address these inconsistencies. Developing. Update of 2:15 p.m. -- Frank Xie showed his three web sites, two of which his mother in China does not have access to. China, he says, is exporting its web-blocking technology to North Korea, Cuba and Sudan. Nora Younis of Egypt details Egypt's crackdown on bloggers who cover violence between Muslims and Copts and, as she did, the beating of Sudanese refugees in Egypt. Meanwhile, Ban Ki-moon and Condi Rice are in Egypt. Will they mention this? We'll be watching. Update of 2:35 p.m. -- Inner City Press asked Nora Younis if the UN is doing enough -- or anything -- to raise the issue of press and blogger freedom in Egypt. No, she said. The UN is not doing enough. Inner City Press asked Mr. Krilla what the U.S. is doing about Ethiopia's CJP-exposed crackdown on reporters. "Good question," he said, mentioning that he'd been in Ethiopia a few weeks ago and that other countries should also apply pressure. But what is the U.S. doing? A speaker raised the point that Tunisia, which uses censor-ware from U.S.-based Secure Computing, blocked full Internet access even at a UN event -- something on which we hope to have more to report soon. On the other hand, it's to the U.S. Mission's credit that it pushed to hold this panel discussion, and inside the UN building. Who else would have done it? The UK, for example, even when it got a briefing on Zimbabwe, consented that it be limited to humanitarian issues, and has yet to follow up on it. That said, not only is the U.S. for example trying to have it two ways with Ethiopia, it's own Mission to the UN falls short of Republic of Congo, Peru, Russia and China in that U.S. Ambassador Khalilzad has to date refused to hold a press conference on his plan of work as Security Council president for the month of May. Every other recent Council presidency has held such a press conference, allowing the press -- blogger(s) included -- to ask about what's on the agenda, and what's not. But the U.S. falls short, and has yet to provide any explanation. Developing (it is hoped). Under North Korea law, it is a crime to leave or attempt to leave the country without permission. Therefore, Mr. Guterres said, the moment China moves to return them to North Korea, they become refugees. It was an interesting answer, but pointedly did not criticize China for its actual policy of refoulement -- sending asylum seekers back to face torture. Mr. Gutteres said, he was a politician for 30 years, but now that he's at UNHCR, he won't answer political questions about who's to blame for the displacement. But what about when it is the UN itself that is supporting the displacer? We'll have more on this.